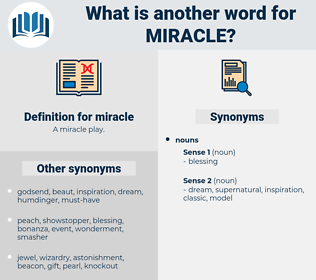 What is another word for miracle? 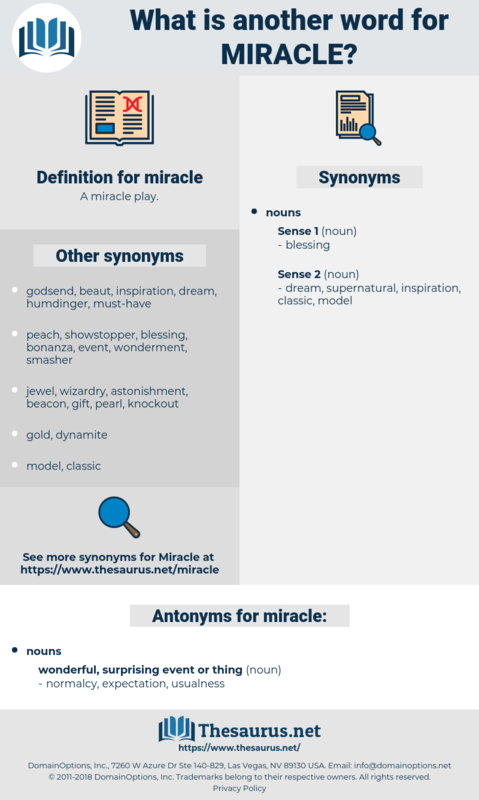 Sous, wonder, prodigy, magic, panacea.
" I did not dare," said Frances, " to pray for another miracle." Virginia arrived, using her own eyes for the first time in years, and the sisters and their mother laughed and cried together over the miracle of the cure. Mary Shelley, marsilea, Marc Chagall, mirasol, Myrica Gale, marsala, monarchal, morchella, marcel, marshal, marseille, marshall, monarchical, murkily, minor scale, morsel. transfiguration, assumption, Transfiguration of Jesus. happening, Occurrent, natural event, event, occurrence.